Community Living Chatham-Kent is excited to support United Way of Chatham-Kent’s Operation Backpacks 2017 Campaign. Our 2nd Annual FOOD CRAWL fundraiser on July 20 was a tasty treat for 184 participants. People travelled in school buses to restaurants across Chatham to delight in food, and fun. We surpassed our goal raising over $8700. Through Operation Backpack, children are excited to receive a new backpack and school supplies to encourage them to be the most they can be, and to be successful in school. 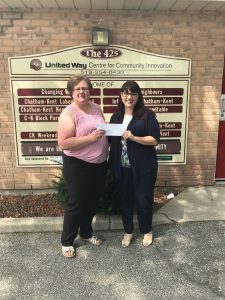 Community Living Chatham-Kent prides itself in being an active community partner, and is proud to be a part of this program. From the profits of the 2nd Annual FOOD CRAWL, we are delighted to donate $1000.00 to Operation Backpacks. We hope the children receiving the supplies will be able to fulfill our vision of discovering dreams and connecting lives.